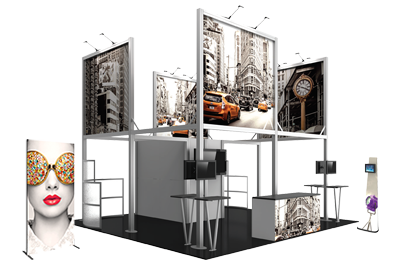 Hybrid Pro™ Modular Kit 07 is an off-the-shelf display kit that has the appearance of a fully custom display. Kit 07 combines sturdy aluminum frames with high quality graphics for a striking display, and features a central monitor mount and counter with locking storage that add function and additional messaging space to the exhibit. Top and side canopy-style pillowcase fabric graphics add the "wow" factor to the display.